Well, after 28 days of solid writing, thinking, more writing, less thinking and then more writing, I was able to submit my novel to the NaNoWriMo servers, and just as Scrivener had told me, I was clocked in just under 51,000 words, so I’m a winner! As you can see from the last week stats below, taken from the NaNoWriMo site I was [finally] getting ahead of the game on word count and really it was because the story was just flowing out and everything seemed to be falling into place. I added a few more secondary characters which I think added a bit more texture to some of parts of the story and helped the plot line, but still, the issue was getting to the end of the story, and so I had to simplify some of the subplots, and one arc which I’d decided in week two I was going to have to miss out never made it back in. I’ve been really pleased actually with the writing rate and that I was having to decide what to take out, rather than trying to come up with new things to put in to fill space, though paradoxically, new things were creeping in just because they seemed to fit what was going on. So what did it end up being about? Set in an alternate steam technology based version of Japan’s opening up to more external influence and trade in the mid nineteenth century, there is a stand-off between the three regions left from the recent civil war, and it tells the story of how various groups are attempting to gain technology and power in order to take on the others. The narrative is driven by three main protagonists trying to find out who or what is is pushing events forwards following the murder of a trader outside Yokohama, but draws on rogue British delegates, Royal Societies, a splintered Japanese samurai class and just normal Japanese people trying to decide what they want now that there seems to be so many new opportunities. One interesting thing which happened which I wasn’t expecting or intending, is that the story, characters and scenario actually lend themselves to a second story which would largely need to take place in Britain (though not in London like many steampunk novels) and Hong Kong instead of Japan. I have to say I felt a real sense of accomplishment upon seeing that I’d topped 50,000 words, after what had become a habit, and almost a compulsion over the last four weeks, going from feeling like it was a grind, through to a feeling of obligation, and then in the second half of the month of actually being keen to sit down and get on with writing. As you can see from some of the posts, word count does become a obsession at the beginning, I suppose because you’re left with the impression that you’re behind schedule, and then that disappears when 2,000 words a day just flow out. I’ll admit that since ‘winning’ I’ve had that sense of ‘what now’? Broadly speaking, the vast majority of my writing was done in one of two scenarios – either on my MacMini, at the desk on a full size keyboard, or on my aging MacBook at the dinner table, and it all seemed to work well. I definitely recommend Scrivener – even though I’ve used it for a few years for short stories and such, I really found why it’s such a good writing tool this last month, making it simple and quick to jump between writing, character info, story research all within the one app and quickly able to find things, without interrupting the flow. That concept of flow was essential – as I learned early on, to stop to check and correct grammar and sometimes even spelling is a massive mistake and to just keep going as NaNoWriMo is about getting a novel first draft done, not the finished article. Somehow I thought I’d have developed a ‘soundtrack’ during the writing, but it never really happened; as I look through the list of recently played tracks in iTunes it’s a selection of certain songs, and I think by hour I probably wrote mostly without music. The tracks I did listen to though were quite interesting – some were tracks I hadn’t listened to in years – and seemed to fit certain chapters of the book – I listened to Jean Michel Jarre’s “Revolutions”  which fit some of the steam punk parts, and also the soundtrack to the classic “Akira” by Geinoh Yamashirogumi which has a mix of more traditional elements and modern styles. One rather sad thing is that I still don’t have a title with my NaNoWriMo dashboard recording it as “Japan Steampunk Novel”. My plan right now for the novel is to let it sit for a few weeks, and then start a second draft. Yes, I’m going to see this one through to some kind of ‘finished’ version, something I struggled with on my only previous attempt at a full length novel. I’m keen to add in a couple of story arcs in which never made it into this initial draft – the main one being the arms dealers supplying one of the main factions which was to be set in my home town in the UK (Grimsby) which in the timeframe of the story was ramping up as a major port. This makes one subplot (the factions within the British Government and Royal Societies) a bit clearer and shows that the main story is just another part of a larger political policy being executed. 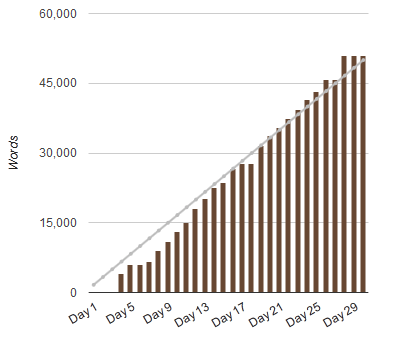 As for NaNoWriMo, will I be doing it again next year? I honestly don’t know. It required a lot of time and and patience from the family, and November is quite a busy time of the year for us with other events, so I really don’t know, though certainly the next time I do NaNoWriMo, I wont be as worried about word count. That said, it has been a lot of fun, and I would definitely encourage people to give it a try next year – or any month really – and just crank out 50,000 words.